(2012 Intimate Moments Contest) Snowdrop realizes that the answer to her problem might be more obvious than she thought. The night was cool and clear, and for that, Snowdrop was grateful. She sat with her wolf-friend beside the Holt�s River, the sound of the water rushing by and the night-time bugs humming. The familiar noises created a pleasant environment and helped soothe her conflicting emotions. Her wolf-friend gave a little sigh of happiness as Snowdrop scratched her between the ears. �I�m glad I have you at least, Hightail,� Snowdrop said affectionately to the young wolf. Wolves were much more uncomplicated in their thinking than elves. This particular night, Snowdrop was thinking about the last time she had shared furs with Moss, just a couple of nights ago. He had mentioned that they would make good lovemates, but Snowdrop had refrained from agreeing or disagreeing with that statement. She was quite fond of him, but was that fondness equivalent to love? Somehow, Snowdrop just couldn't be certain. Snowdrop wasn�t sure just how long she sat in silence with the wolf, listening to the comforting sounds of the night, before she heard a voice from behind her. Snowdrop recognized the voice of her friend Kestrel before even turning her head. She guessed that the night breeze blowing against her face had kept her from scenting the glider, for it was a scent that she knew well and most certainly would have recognized. Snowdrop turned and smiled warmly at her friend. �Just trying to clear my head a bit. This spot always helps me relax,� Snowdrop answered. Kestrel smiled at that. �It appears that�s something we have in common. Would you prefer to be alone, or do you want some company?� the glider asked. If it were anyone else asking that question, Snowdrop wasn�t sure how she would respond, but oddly enough she thought Kestrel�s companionship would be nice right now. Snowdrop motioned for Kestrel to join her. It had been a few turns since Kestrel had lost her last wolf-friend, and Snowdrop knew that Hightail was a comfort to her. Besides that, the white-haired elf figured that her friend might be able to provide some insight into her problem. Kestrel took a seat on the other side of Hightail, patting her affectionately on the back. �Can I ask you something?� Snowdrop started hesitantly. �Why is it that, in the amount of time we�ve been friends, you�ve never had a lovemate?� she asked quickly, a blush spreading across her pale cheeks. She knew that Kestrel was often willing to share the furs with others, including herself, but she had never seen the glider share a den with anyone permanently. Snowdrop nodded pensively, eyes focused on the river. In a way, what Kestrel was saying echoed her own thoughts. There were plenty in the tribe who would be glad to call her lovemate, and with the amount of time she and Moss had been spending together recently, some in the tribe, even her parents, had thought they would become lovemates. But it didn't feel like love to her � Moss was just fun to be around and easy to get along with. Did Snowdrop love any elf enough to lovemate with them - to share things about herself that she wouldn't share with just a friend? Sensing that the mood had gone a bit somber, Snowdrop turned to smile at Kestrel. �You know, I always just thought that it was because you were too in love with gliding,� she said. Snowdrop wasn�t quite sure, but she thought she saw a twinkle in the older elf�s eye. Snowdrop�s expression turned quizzical as Kestrel stood and moved towards the trees, but she followed suit and stood up, sending to her wolf-friend that she�d be back in a little bit. As she walked to where Kestrel was now looking up, eyeing a particularly broad-trunked tree, she raised an eyebrow, not quite sure what her friend was looking for. Then, Kestrel nodded once to herself. �This one will do,� she said, before picking a sturdy branch and hoisting herself up. She motioned for the younger elf to follow her and started quickly up the tree. Snowdrop began climbing up the tree behind her, wondering at first why the glider didn�t simply fly up to the top, but she figured Kestrel wouldn�t want to leave her behind, and she was grateful for that. The two of them made good time, pacing themselves so that neither was winded when they reached the very top. �I�m surprised you�re so good at climbing. You hardly ever have use for such a skill,� Snowdrop commented. Kestrel laughed. Snowdrop nodded. There had never been a time when she hadn�t known Kestrel, but there were many turns of the older elf�s life that Snowdrop hadn�t been a part of. It amazed her to think of that sometimes, because though there was a large age difference, she often felt that no one in the tribe understood her as well as Kestrel did. They might as well have been agemates with how often the two were of the same mind. 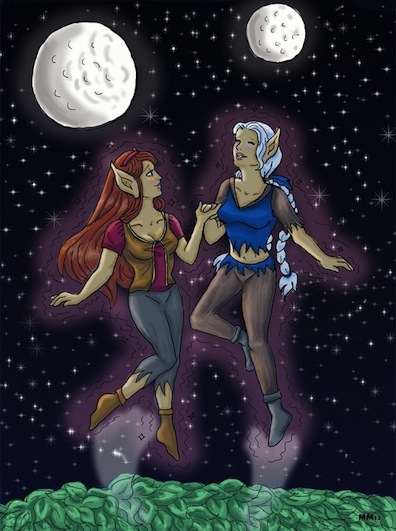 Snowdrop was shaken out of her thoughts when she realized that the glider was now rising into the air above her, and as she looked at the older elf, seemingly weightless with her long auburn hair flowing about her in the breeze, she again thought that Kestrel had never looked more beautiful. **Take my hand,** Kestrel sent to her. Snowdrop frowned slightly; to do that, she would have to balance on the thin branch she was standing on, but she quickly hardened her resolve. She knew Kestrel would never, ever let her fall. Snowdrop held out her hand, and as Kestrel held on tightly, she stood up on the branch. Then, slowly, she felt herself begin to rise until she was looking Kestrel in the eye. Her eyes widened as she realized what Kestrel was doing, and she gasped in wonder. The two of them rose higher, and Snowdrop closed her eyes, feeling as though she weighed nothing at all. She tilted her head back and stretched out her free arm, feeling that as she left the world behind, so, too, were her worries far behind her. Kestrel�s grasp on her hand was so gentle, now, that she felt as if she were floating on her own. As the breeze ruffled her long white pigtails, Snowfall wondered to herself if she looked even half as lovely as Kestrel did when she flew. Opening her eyes, Snowdrop saw Kestrel smiling at her. **And now, you understand,** Kestrel sent to her, receiving a blissful nod in return. Snowdrop was surprised. In Kestrel�s send, she saw herself as Kestrel saw her, at the same time feeling Kestrel�s joy in sharing this together. It couldn�t have been more than a few moments that the two were gliding above the trees, and Snowdrop knew that if they did this much longer, it would cost the glider greatly. As it was, she could feel the hand that held hers beginning to shake. Snowdrop reached over and took Kestrel�s free hand in hers, nodding to signify that she was ready to go back. They drifted slowly down, choosing to settle on a particularly thicker branch slightly lower down from the top of the tree. Kestrel leaned back against the trunk, closing her eyes and taking a bit of time to breathe deeply. Snowdrop kept her eyes on the older elf, seeing the auburn-haired glider in a new light. She could hardly believe that the glider, who trended towards solitude more often than not, had chosen to share this with her even though it took so much out of her. And yet, if the situation had been reversed, Snowdrop thought Kestrel would be the one she would share her gift with as well. There was no one else in the tribe, she realized, whom she understood more or trusted more. Smiling to herself, Snowdrop leaned forward and rested her head on Kestrel�s chest, feeling the older elf�s heart beating strongly. The glider, in turn, put her arms around Snowdrop. **Thank you, Kestrel,** Snowdrop sent, finally content. And as she lay there in the glider�s arms, she smiled to herself, thinking that the answer to her dilemma might have been here all along.